I'm back this month with a new stamp set for the April Papertrey Ink release, I'm happy to introduce to you... Trendy Tree Tops. Trendy Tree Tops is a fresh and new tree building set. This set features 1 tree trunk with 4 interchangeable tree tops, 3 coordinating images and 4 uniquely detailed sentiments. To top it all off... a set of 4 dies coordinate beautifully with the entire set. 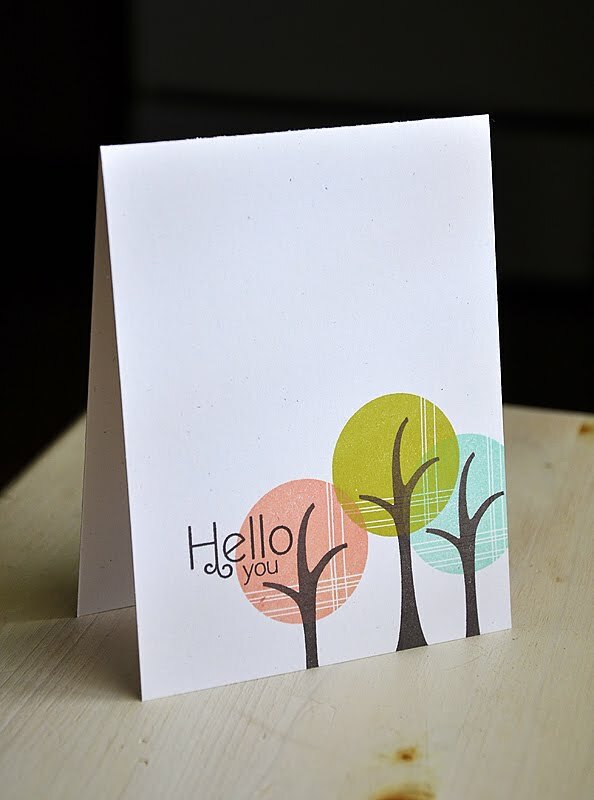 Trendy Tree Tops stamp set will be sold for $15, beginning April 15th at Papertrey Ink. How about a couple samples?!... First up, a simple stamping of a tree top, trunk and a sentiment. I kept things super simple to really let the detailing in this tree top image be the star of the show. Stamped the tree top in Melon Berry and the trunk and sentiment in Smokey Shadow. Finished the card off with an embossed cardstock strip and a couple Fine Linen buttons. Next up, a single layer card... which I started by stamping the three tree trunks in Smokey Shadow ink along the base of the card front. Stamped the tree tops in a color combo of Melon Berry, Simply Chartreuse and Aqua Mist. Then finished the card off with a sentiment. Now, be sure to visit Nichole Heady and Besty Veldman for peeks at Tweet Talk and Think Big Favorites #15. Also, Heather Nichols, Dawn McVey, Melissa Bickford & Lexi Daly have peeks to share with you of their newest sets for the month. Oeh, these are pretty!! 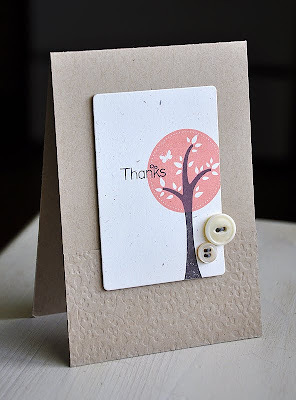 Love especially your second card and the way those tops look with the lines in it, gorgeous!! Lovely designs, Maile!! Love your fresh take on things, Maile! These trees are awesome!! Love, love, love your trees!!!! So fresh and fun!!! OGM your cards are gorgeous. The Single layer card is stunning. I think your new little trees look so fresh and adorable! Can't wait to see more of them! 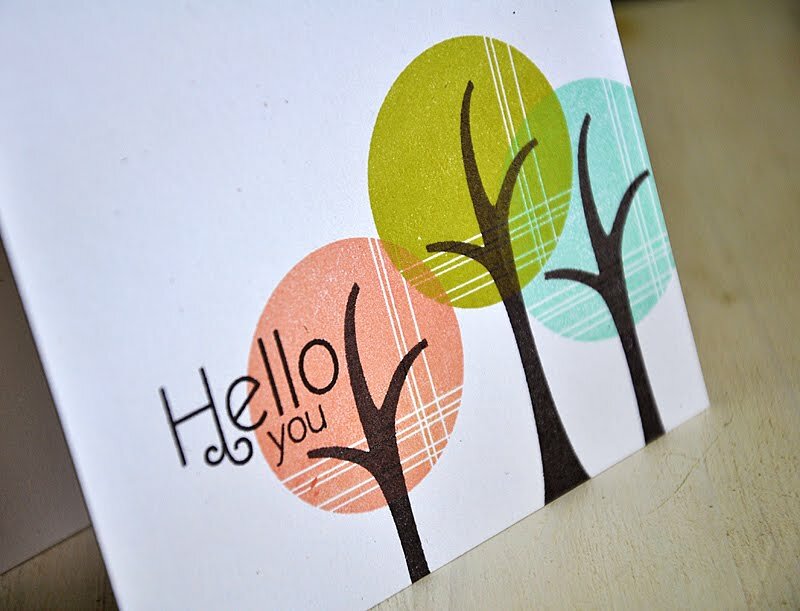 Lovely card and love the vibrant trees! I can't wait for the online class and your instruction...You have such a lovely style. so cute-hey I have and idea for a stamp. So many companies are doing city skyscapes-we need on for KC, right! wow.. what a lovely tree. Fabulous new stamp set and great cards ! Perfect as always. Love your color and design choices. Gorgeous. LOVE this concept, Maile!!! And your samples are BEAUTIFUL!!! Can't wait to see the full reveal of this set!!!! I love tree images and these are just the best. Love them! I do love trees and these are no exception....great to have a way to make single-layer cards, too!